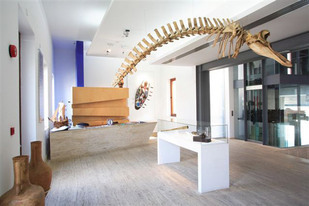 The THALASSA Museum is directed by the Pierides Foundation, in association with the Hellenic Institute for the Preservation of Nautical Tradition and the Tornaritis-Pierides Marine Life Foundation. It opened in August 2005 and it comprises the cornerstone for the local cultural infrastructure of Agia Napa-Cyprus, has the sea as a subject-matter. It is the first museum of its kind across the Mediterranean region with main principle to present to the audiences, the local and foreign visitors, the impact and the significance of the sea upon the history of the island. 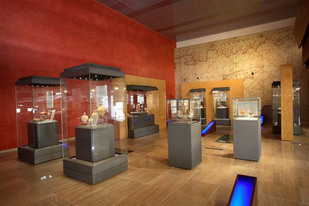 The exhibits of the museum cover a chronological span, from pale ontological to prehistoric periods until present times. The museum is a three story building made by marble, onyx, wood, metal and offers unique experiences appealing to all our senses with its ‘bird eye view’. It incorporates six levels and the exhibits are presented with four different methods: in underground showcases, where the visitors are able to walk and view the objects from the top or in modern showcases. Other exhibits are freely placed in the museum whereas other the rest are hanging from the roof. All exhibits are spotlighted by fibre optics. At the first level the visitor gets informed from 12 large audiovisual panels on the history of Cyprus. The film shows all the historical periods of the island throughout the centuries. At the second and third levels Cypriot antiquities, which cover 8000 years from the Neolithic period to the Venetian rule (6000 B.C. to 1570 A.D.) are presented. Among the most important exhibits are a composite vase with vertical handle of red polished ware of the Early Bronze Age III (2100-1900 B.C. ), a spectacular clay model of a ship with sailors and captain of the Cypro-Archaic II period (600- 480 B.C.) and four red figured plates decorated with fish of the Classical (475-325 B.C.) and Hellenistic periods (325-30 B.C.). The replica of a Mesolithic (9200 B.C.) papyrus vessel (experimental Marine Archaeology) is also exhibited at the second level. 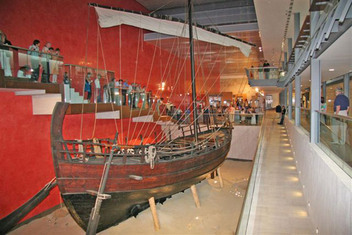 The main exhibit at the fourth level and of the museum itself is the ‘Kyrenia II’ vessel. A life size exact replica of the ancient ship of Kyrenia of the Classical period (400 B.C. ), which was built in 1985 for scientific experimental purposes by the Hellenic Institute for the Preservation of Nautical Tradition of Athens. The ‘Kyrenia II’ was exhibited in several cities in Greece and worldwide like in New York, Japan’s Nara, Sevilla and Hamburg. At the same level and while the visitor walks on a glass floor where a reconstruction of the old shipwreck is displayed, it is shown a documentary film about the excavations of the ancient ship and the preservation of it, which took place in the now occupied castle of Kyrenia. 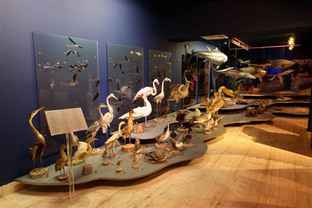 The fifth level hosts pale-ontological exhibits of the Tornaritis-Pierides Marine Life Foundation, which include fossilised fishes, shells, corals, ammonites, trilobites and rudists of the late Cretaceous period (130 to 65 million years). 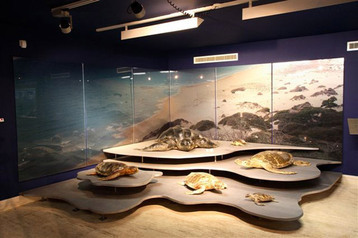 The Marine Life section is located in a semi-basement level. It shows the marine fauna of the Mediterranean, helping the study and research of this geographical part’s Natural History, but it also stresses the importance and necessity of preserving the marine environment. The exhibits include marine organism such as shells, barnacles, corals, sea-urchins, starfish, crabs, lobsters, sponges, sea fans, marine plants and others found in various parts of the island. Moreover it has stuffed fish, mammals, sea turtles of the Cypriot and Greek seas, and an important collection of sea and lake birds in their natural habitat. It must be pointed out that all exhibits were collected after their natural death. It is imperative to mention that not a single specimen was removed alive from own its environment. The most important exhibitions and events, which are planned for the next couple of years are: a contemporary art exhibition entitled ‘Shell and the Arts, The ornaments of Aphrodite’; a contemporary art exhibition with paintings of the Greek painter, Panagiotis Tetsis focusing on marine landscapes; and the 10th International Symposium on Ship Construction in Antiquity with the participation of 200 academics from 45 EU and non-EU universities. Opening hours and entrance fees subject to change.